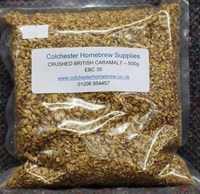 Crushed British Caramalt is used in all grain and partial mash brewing. In full mash brewing, Caramalt is a often used in beer recipes when you want the "biscuity" flavour of crystal malt, but don't want to unduly darken the beer. It has a typical EBC rating of 30. This convenient size is normally sufficient on its own to satisfy your recipe requierments for 2-3 brews as most recipes containing crushed British Caramalt only tend to need 125-250gms per 5 gallon/ 23 ltr batch.